Julie, why should I take the time and spend the $$ for Solace? Why should you take the time? To discover what can happen when you exhale and allow yourself to be nurtured by nature, your Host and her Assistant, and the company of other women. To experience what can only come as a result of getting away—truly, truly, away with miles and miles between you and the distractions, disappointments, and deadlines of work and home; to retreat to the beauty and solace of a salt-water beach and the company of other women who have made such an individual trip a priority. Why should you spend the $$? 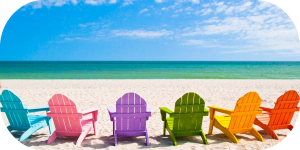 Because every dollar of your expenditures will ultimately be a refunded to you in priceless experiences: be it setting foot (and beach chair!) on the World famous, first-class, destination beach location of Captiva Island; the luxurious amenities of our home; the company of new friends or a best-friend who joins you; or the incomparable experience of your first Captiva sunset—you’ll find it worth every penny spent. No one has demanded a refund yet. Julie, how structured are the days/nights you’re planning? Will I have time to be alone? To nap? To discover the Island? Will you have time…absolutely! Early morning-late night snacks, tea, coffee, are available for your enjoyment. Brunch is set for 10:30 a.m. and each woman is free to awaken when she desires or when the natural sunshine of a Florida morning beckons. I run Solace Gathering in the same manner I’ve approached conference and retreat keynoting since 1998; “I know where I’m going to start and I know where I’m going to take you, but what happens in-between is unique to this time and this place.” So too Solace. The world has enough schedule-driven conferences and retreats. Here you can expect a guest-friendly, loosely structured gathering filled with purpose and ample personal time to discover just that. Julie, what’s this Soul Care & Spiritual Direction which you’ve spoken about and what part does it play during our time at Solace Gathering? We are a Gathering of women and soon-to-be friends with whom I look forward conversing in all aspects of life and according to the personality and desire of the each individual. My heart’s desire is always and only to be used in a way which moves a woman closer to the God who is at work in, with, and for her, in the totality of life–which is the very definition of Soul Care. Julie, what’s expected of me? Solace Gathering is all about exhaling, remember? You’re expected to show up; unpack (or, live out of your suitcase if you prefer); exhale deeply; laugh; share as little or has much about yourself as you like; exhale again; and embrace each and every aspect which speaks life to your body, mind, and soul.